All Contents © 2006 Robert Morgan Fisher. All Rights Reserved. No part of this Web site may be reproduced without express written permission, except for review purposes. And yes, 3pm-Midnight is a long show – but this is a luxurious auditorium with couches and everything. Price includes admission, beverages and Tito’s Tacos while they last! POTLUCK contributions strongly encouraged and appreciated. Thanks, Dan -- and thanks to all who performed and attended. And BIG thanks as always to Ron Safarty who edits and posts our stuff on YouTube. There are other "bootleg" Folktacular videos on YouTube as well, mostly of Dan Bern. More to come! This was a great show -- thanks to all who were there! "We'll Buy a Flag" video goes #1 on Neil Young's Website! A while back, some anonymous fan created a "video" of my #1 song, "We'll Buy a Flag," and posted it on YouTube. The song showed up on the NEW VIDEOS side of the Neil Young site and debuted at #2. Since then it's bobbed up and down the chart, lately remaining in the Top Ten. For the week of February 11th"We'll Buy a Flag" was rated #1 out of 400 videos. Would you please click on the following link and keep this video at #1? Watch what this person put together -- it's not bad. Then minimize the playing screen, go back to the menu and click-away on the video. Every click is a vote and it's possible to hit it, like, 40 times a minute. Unlike electronic voting machines -- these votes all count. I want to thank all of you who braved the heat and holiday traffic and parking difficulties to attend The Folk-tacular yesterday. Though it was not as big a crowd as the first one in February, those who came were well fed and entertained and most stayed right to the end. Which on the time-challenged planet of Folktaculon, could have arrived on time (which it did), or not for weeks. The performances were uniformly fine and many moments skirted the transcendant. Too many to mention, though none of us will soon forget Lorin Hart's throw-down opening number. I made a lot of new friends, everybody did, and I heard more than one of them marvel at this group of people, and the open all-equals relationship between performers and audience members. In this world, the lines have been blurred to near obliteration. All of us who write and sing and play know perfectly well that a thought or a note is a stray arrow till it finds it mark. The commitment too is equal. One who came to play was in a traffic accident en route and had his instrument laden car TOWED to the gig. One who came to support and listen had lost a dear friend to another traffic accident just days before. We love this music and this process, and we know it nourishes us and makes our lives ring with meaning. That, and not any adherance to genre, is what makes it FOLK music. I once thought being a folky wasn't hip enough for me, but I've lived long enough to realize that nothing's hipper than speaking your heart. And no rock and roll hairstyle is braver or more subversive. A wise person once asked, "How hip can you be if you have to wear a uniform to prove it?" What I really want to do is remind us all that this is a DIY thing. WE make this music AND give it a place to live. House concerts, hosted music series' in public venues, mini-festivals like Robert's Folk-tacular (we just love saying that), are worth doing and totally do-able. So let's do them, and stay in touch so we don't counter-book each other too much. An aside. A young woman who was performing at the rival fest next door yesterday (and I believe, a friend of Larry Wines') took me aside and told me how impressed she was at the contrast between our "peaceful, and friendly", show and the more mainstream commercial scene going on around the corner. Hell she even bought a CD or two. So thanks to you all and to Robert and all the people who helped him put on a great show. Feel free to pass this on; my email list is less than comprehensive. 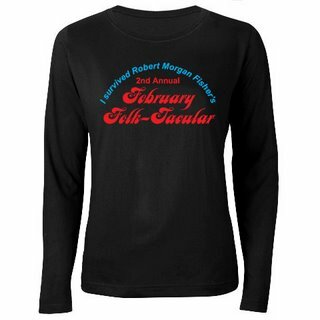 The first ever Robert Morgan Fisher February Folk-tacular at Santa Monica's Bergamot Station was a huge success by all accounts. Tito's tacos and beer were had by all and the music went on for a good 10 hours. Stellar sets were contributed by: Tommy Wallach, Paul Zollo, Piper/Grey, Dale LaDuke, Dave Morrison, Amy Kuney, Chad Watson, Freebo, John Andrew Parks, Wendy Waldman and of course myself, Robert Morgan Fisher. There was also a brief set by visiting troubadour and old friend, Bradley Ditto. Thanks to all who contributed in every way including the performers, audience members, Dana Charnovsky, Larry Wines and all the good people at Writers Boot Camp. While it's a little early to predict, I'd say the chances are good that this can be an annual President's Day Weekend/RMF birthday event. Not only that, but plans are being made right now for the next Folk-tacular a few months down the line. Watch this site for details on this and all other RMF gigs.